Until quite recently these were regarded as the largest extant Canary Island lizard and the largest lacertid. With a snout to vent length of 24 cms they are actually marginally larger in body size than the Eyed Lizard although being somewhat shorter tailed they cannot match the total length. (They have a number of close relatives previously believed extinct which have been found in small numbers in restricted locations in the Islands. These are true giants among Lacertids, exceeding Eyed Lizards in length as well as mass despite the relatively short tails). Unlike almost all other Lacertids, this species is truly omnivorous. When fully grown they tend to be a relatively dull looking lizard in terms of colour but make up for this in their size, ease of maintenance and in usually becoming readily tame. As a consequence they and the Timon species are probably the only Lacertids which really has the potential to be a pet lizard. Indeed, this is a Lacertid that can rival Bearded Dragons in terms of tameness and is actually far easier to keep and maintain. The animals I keep are all descendants of animals acquired from the pet trade during the 1980s. So far as build is concerned these animals are typically Lacertid. When fully mature, the male's head is disproportionately large rather like the Eyed Lizard - but even more so. The base colour tends to be grey on which a fairly haphazard number of dots, blotches and bars appear. These can vary in colour from light grey to pale blue and cream or reddish - sometimes all at once! Unfortunately, as they grow older the markings and colours tend to become even less apparent. The exception to this is the throat which can be brick red in females and is invariably so in males in which this colour extends to the cheeks. This is a European Protected Species. These spectacular animals will need to be kept in indoor vivaria for at least part of the year and can be successfully kept in this way all the year round. A pair need a vivarium of at least 1.2m x 0.6m x 0.6m. A semi desert set up is suitable and there is little point in trying to plant it as they will almost certainly eat the plants. Like all lizards they must be provided with adequate hiding places and thick branches or similar should be provided for them to climb. With these animals it is perfectly acceptable to have a hard substrate although, of course, this should not be glossy - they do need something to grip with their claws. UV lighting is essential. This can be either a UV-emitting fluorescent or a Mercury Vapour lamp. In the former case the animals should be able to get within 15 cms of it. In the latter case probably no closer than about 30 cms. It is imperative that the animals are able to move completely out of the UV radiation if they wish. A temperature gradient is also essential so if a fluorescent is used a suitable basking source must be offset towards one end of the vivarium but which is also exposed to the UV output. In the case of a MV lamp then this can also act as a basking lamp due to its heat output which means it also should be offset towards one end of the vivarium. Alternatively a separate basking lamp can be provided close by but the MV lamp limited to perhaps 6 - 9 hours per day. The hiding places already mentioned should be towards the cooler end of the vivarium. Whatever the heating and lighting sources the vivarium should provide a temperature gradient in the range 20 - 30 degrees C with a hot spot directly under the heat spot which can peak at 40 C. For between 6 and 9 weeks a dormancy period must be provided especially if the animals are to breed. During this time a background heat should ensure that the vivarium as a whole sits at around 10 C. Obviously it is best to gradually reduce the heating to this level and to gradually increase it after the dormancy period. Since the heat source itself will obviously be hotter than this the animals might occasionally emerge if the background temperature increases, but this does not matter - they are not true hibernators. A water bowl should be provided and an occasional light morning spray might be required by some animals if they do not drink from the water bowl. These animals will particularly thrive if they can spend late Spring to early Autumn in a greenhouse glazed with a UV transmitting sheeting. Cold spells are not likely to be severe enough or extreme enough to adversely affect them during this period. Mating takes place during the late Spring to early Summer and is typical of lacertids (see our Breeding pages). After a period of 1 to 2 months the female will be extremely fat - individual egg bulges are often visible. She will usually dig one or two test burrows in a warm spot before choosing where to lay the eggs. She will lay anywhere from 8 to 25 eggs and, ideally, these should be dug up and incubated artificially. When the young hatch, they will usually start feeding within 24 hours of birth. In optimum conditions, the adults will mate again and produce a second clutch about 8 weeks after the first. It is wise to keep them separated from the adults for the first few months of their lives or they will almost certainly be cannibalised. Growth is extremely rapid but the combination of female rivalry and the size of the adults means that it is seldom a good idea to put them back with the adults. These are one of the most pronouncedly omnivorous lizards you are ever likely to come across and and adults should be fed greens (curly kale, dandelion greens) dandelion flowers and some fruits (peppers, tomatoes, grapes) together with a suitable range of insects. Most individuals will also take cat food but this should be given in moderation. Similarly, there are few things they like more than banana but being very high in potassium this should be used sparingly as a treat. When fully grown they can handle any of the invertebrates listed in our live foods page. These should be gut loaded and dusted with a suitable multivitamin powder. In addition as large animals they will benefit from the occasional pinky but plant matter should predominate in adults. If you are fortunate enough to have them breed then hatchlings/juveniles require small to medium insects - all but adult crickets are good as are mealworms or other similar sized prey. Gut-loading and vitamin dusting are essential. They are more pronouncedly insectivorous as youngsters but some fruit and vegetable content should be offered. Numbers of these animals were imported in the early 80's and before but none, to the best of my knowledge, since then. There are a few breeders in the UK who will occasionally have surplus captive bred animals and these should be your source. Mark Harris has also started breeding these animals at his "Dragon Farm" in Portugal and these will be made available in the UK. Again, ensure you have some form of certificate that any animals you purchase are captive bred. 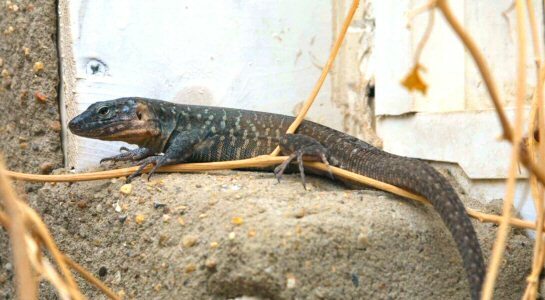 A similar species in its requirements is Gallot's Lizard (Gallotia galloti). Not so bulky and usual more colourful but is a little less easily tamed. Sub-species G. g. eisentrauti tends to be exceptionally beautiful. Next - Physignathus cocinchinus - The Chinese or Thai Water Dragon.